Everyone who has volunteered knows the obvious rewards - self-satisfaction and the feeling that you've made a positive contribution. My husband and I had logged a few volunteer hours before retirement. In addition to school, church and community ventures with our children, over the years we also worked with Habitat for Humanity, veterans groups, special needs kids and HIV/AIDS babies. So when we retired and became full-time RV-ers, it seemed natural to continue donating time to a worthy cause. 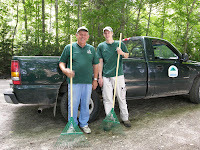 That's how we connected with Vermont State Parks' Volunteer Program. 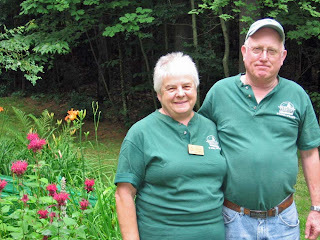 Like most state park systems, Vermont Department of Forests, Parks and Recreation relies heavily on volunteer assistance. Your contribution can be as varied as your individual skills, talents and interests. We chose to live in our RV onsite in exchange for 30 total hours per week commitment. So how has our experience been and what can you expect if you volunteer? Seventy years have passed since Walter Edmonds, now 88, spent a year working on a crew building the toll road at Mt. Ascutney State Park in Windsor. Edmonds enlisted in the Civilian Conservation Corps. in May, 1936 at age 17 on the advice and recommendation of a high school teacher a year before he was due to graduate. "My gosh, this was all a meadow," said Mr. Edmonds, looking around the park entrance, now surrounded by 80-fot tall white pines. "Barracks #1, where I bunked, was built right over the stream there. It sung me to sleep at night." Edmonds spent a misty day in September, 2006 visiting with park staff and telling tales of camp life and work on the mountain. Mr. Edmonds and his daughter Debbie were treated to a buffet lunch and give a tour of the present day park. Come into the Forest and you will see how to spend time more leisurely. There’s something for everyone at Groton State Forest in northeastern Vermont. Whatever season of life you are in you will find year-round fun in the Forest. Pack up the car; grab your fishing pole, camera, bike or a book; leave your cell phone at home (it won’t work here, anyway) and take a step back in time where life moves at a slower pace. 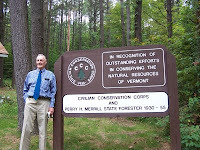 For two weeks this July the Vermont Department of Forests, Parks, and Recreation’s seasonal State Trail Crew marveled at the work of the Civilian Conservation Corps. (CCC), not as observers, but as those who were bridging a 75 year gap. 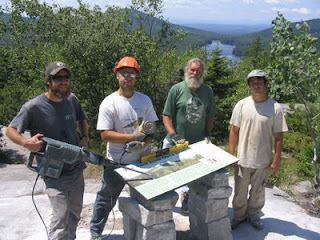 All the projects that the crew is undertaking this summer are in some way linked to the spirit of the CCC, but none as directly as installing an interpretive panel on top of Owl’s Head Mountain in the shadow of the intricately built stone hut. Owl’s Head Mountain is situated in the heart of Groton State Forest. It’s 26,000 plus acres, riddled by trails and specked with State Parks, makes Groton State Forest a gem for recreating and enjoying the outdoors. Driving down Boulder Beach Road, as you near the entrance of Stillwater State Park, your eyes are drawn north by the view and little imagination is needed to understand why Owl’s Head was given its name. Each year four parks, representing each geographical region in Vermont, are presented with the Park of the Year Award. The purpose of the program is to acknowledge exemplary accomplishments of the parks field staff, as well as for the enhancement of public service – to make the parks a better, more enjoyable place to recreate. Competition is fierce and award recipients receive the right to display the coveted "Park of the Year" banner the following season. This year's winners are Thetford, D.A.R., Niquette Bay, and Little River. 1 Killington- a new series of outdoor interpretive exhibits are in place on the Old-Growth Interpretive Trail at Gifford Woods State Park. The exhibits explore the natural and cultural history of what is probably Vermont’s best known and most accessible remaining old-growth northern hardwood forest. The six exhibits are located along the trail and detail characteristics of the old-growth forest, old-growth trees, and development of the park around this unique natural resource. The exhibits complement a self-guiding trail that includes a brochure and plant and tree identification plaques. The exhibit project was funded by a grant from the Vermont Recreation Trails Fund.